Lately, I have an inkling to get back to BW photography. There is something magical about it. I think when done right, the photos come out stronger and powerful. There is also a sense of timelessness. Like remembering something from a dream. That's probably because most of us dream in BW. 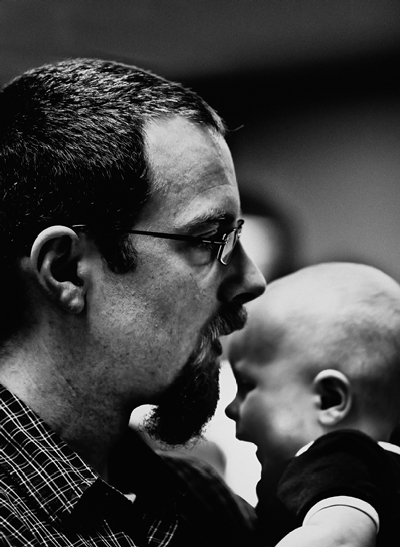 I needed to practice my BW shooting so I took the 60d and the 100mm Carl Zeis to church. I spotted Kevin playing with his son after morning service. Most of the candid shots were botched, and this seems to be the only one that was salvageable. It's not a strong image in my opinion but I feel there is still some universality to it -- something that I always strive for in my images (reclaiming the particulars to create a universal). What the heck do I mean by "reclaiming the particulars to create a universal"? That's for another posting. Cheers.